Contact Center Software Market size is set to exceed USD 40 billion by 2024; according to a new research report by Global Market Insights, Inc. 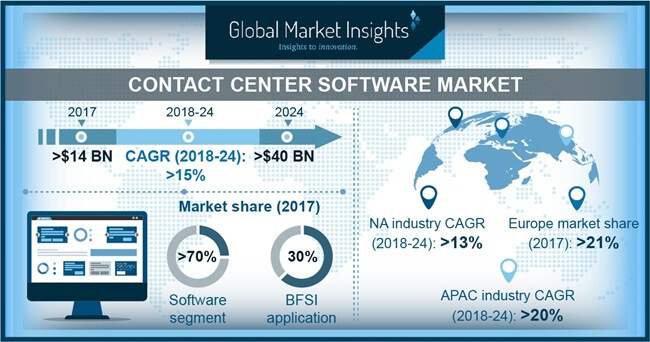 The contact center software market growth is attributed to the increasing adoption of social media platform by customers with the active social media users in 2018 being approximately 3.1 billion. The incorporation of social media with contact center software allows businesses to communicate in an improved way with their current and prospective customers providing improved sales opportunity, increased customer awareness, and high-quality customer service. Around 90% of the businesses now own a Facebook and Twitter account, which enables them to educate and update the customers about their products and services, thereby creating a favorable opportunity for improving the company sales. Furthermore, the increasing emergence of AI-based intelligent virtual assistants in the contact center software market is changing the way businesses carry out their operations by not only providing augmented customer experience but also giving the early adopters an edge over their competitors. The intelligent virtual assistants gather information, predict customers’ needs, and learn customers’ behavior by understanding customer requests and solving complex tasks. The customer collaboration segment is projected to show the fastest growth rate with a CAGR of over 18% in the contact center software market. The customer collaboration software enables organizations to interact with its customers in an efficient way, building long-term relationships. Customers have the advantage of expressing their views about the company’s products and services, which can be considered as feedbacks. After analyzing the comments, the contact center personnel should interact with the concerned customer, ensuring that they are provided with the best products and services. In the contact center software market, the cloud-based deployment model is projected to observe the highest adoption rate with a CAGR of approximately 22% over the forecast timespan. This model offers various benefits such as easy and faster deployment & implementation, greater security, ease of managing remote workforce, improved flexibility & scalability, standardization of global technology & services, real-time data visibility, and customization capabilities, driving their market adoption. It also provides the contact center supervisors with substantial visibility of their agent’s productivity, making them aware of the performance of their outbound campaigns and inbound queues, thereby achieving higher business efficiency. Hence, as the cloud-based contact center software solutions guarantee uptime and flexibility, the organizations are replacing the legacy on-premise models. The IT & Telecom sector is projected to grow at the fastest rate in the contact center software market with a CAGR of over 17% by 2024. The IT & Telecom enterprises are witnessing a huge growth rate due to the rise in the number of mobile devices and internet usage rate. With the aid of contact center software, the telecom industry offers multiple calling and internet usage offers to improve its business sales. It provides the expertise and communication tools required to serve the customers by registering complaints, answering their queries, sending follow up reminders for payments, and delivering value-added services to be proactively connected with their customers. Various telecom companies are also keen on adopting cloud-based contact center software due to the added benefits they provide including lower operational costs and higher flexibility. The U.S. dominates the North American contact center software market with a share of around 84% in 2017. Various tech companies in this country, such as IBM, Google, and Cisco, are investing huge funds in R&D to implement new technologies and augment user experience, enhancing the market growth. The companies are making efforts to reduce the contact center personnel workload by integrating advanced technologies into the contact center software solutions. The high adoption rate of mobile analytics, cloud, and social media platform among various industries also assist the contact center market growth in North America. The Asia Pacific contact center software market is estimated to grow at the highest CAGR of over 20% during the forecast period. The market growth is attributed to factors such as the growing demand from various industry verticals including BFSI, healthcare, consumer goods & retail, and IT & Telecom. The rising adoption of the contact center software by various SMEs also contributes to the market growth. Furthermore, favorable government initiatives for increasing industrial automation also augment the market growth in this region. The companies operating in the global contact center software market are concentrating on improving implementations of customer care solutions allowing professionals to focus on solving complex customer queries, thereby gaining a higher customer retention rate. The major companies functioning in this market include Ameyo, Vocalcom, Cisco, Five9, BT, Avaya, Mitel, Fenero, Oracle, Alcatel-Lucent, Zendesk, ZTE, SAP, Top Down Systems, West Corporation, Aspect Software, and Unify. The global companies are also working toward augmenting their product and service base by entering into strategic partnerships and collaborations, gaining a share in the competitive market.